The Blues were first to score through the boot of young five eighth Otere Black. Then Nonu set up flanker Tom Robinson for the first try in the tenth minute. Seven minutes later the Blues scored again, with Nonu assisting young Caleb Clarke to make it 17-0. The Blues were all over the Waratahs in the first 20 minutes and it looked like they were going to run away with the game. 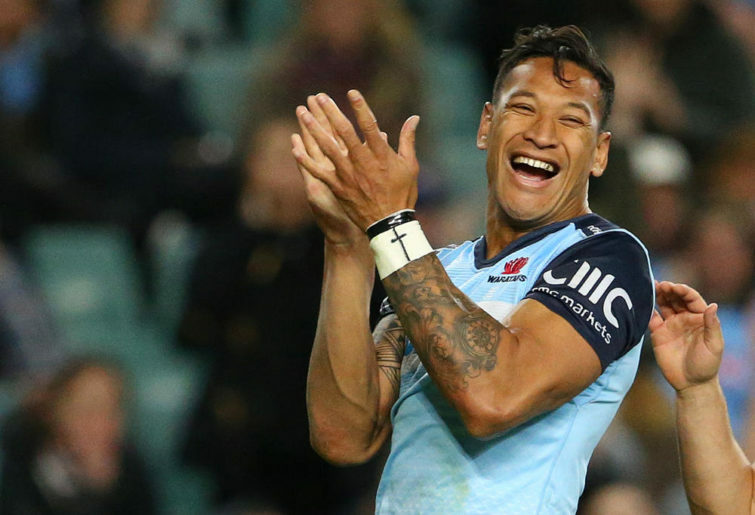 However, the Waratahs came back through Israel Folau in the 24th minute, who in the process of scoring a try became the leading try-scorer in Super Rugby history. In classical Israel Folau fashion, he scored a try off a high kick from Wallabies teammate Bernard Foley. Foley converted the Folau try, and just before half time the Waratah pack powered their way over for Will Miller to score the fourth try of the game in the 37th minute. Foley converted the try and at half-time the score read 17-14. The game looked fairly even. The Blues were the first to score after the break, with TJ Faiane scoring a try off a passing move by the Blues in the 46th minute. The score read 22-14, with Black missing the subsequent conversion. The Waratahs quickly struck back off the back of a line break from Adam Ashley-Cooper and some silky passing. Alex Newsome scored the try in the 54th minute and Foley converted the try to make it 22-21. The next try came in the 59th minute. Rieko Ioane intercepted the ball and set up Ma’a Nonu, who exhibited serious pace to score the try. Black converted the try, making it 29-21. The Waratahs reduced the margin to four points when Foley converted a penalty in the 63rd minute. Israel Folau saved a certain try with a wonderful tackle on Akira Ioane. However, the Blues took the lead out to seven points. Otere Black converted the 66th-minute penalty to make it 32-24. The game was tense, and the Waratahs struck in the dying minutes through a solo try by Jake Gordon, who spotted a gap in the Blues defence and took full advantage to score in the corner in the 76th minute. The score was 32-29 with four minutes left. The Blues ground it out in the dying minutes, racking up phase by phase and eventually getting a penalty. Otere Black kicked the ball into touch and the Blues won 32-29. The stars for the Blues were Caleb Clarke and the evergreen Ma’a Nonu. Clarke, who is the son of former Blues and All Black centre Eroni Clarke, was impressive in attack and defence. In attack he racked up six runs for 25 metres, made one clean break, defeated three defenders and scored a try. In defence he made six tackles, including two try-saving tackles in the second half. Nonu showed he still has the skills and stamina by playing the full 80 minutes and impressing in attack as well as defence. The All Blacks great made two try assists, scored a try himself, exhibited real pace and made nine passes and four kicks, including a 55-metre kick into the corner. He also made seven runs for 49 metres, made a clean break and beat two defenders. His defence was commendable and abrasive as he made eight tackles for the game. Nonu has made it clear he wants to represent the All Blacks this year, and with a performance like his on Saturday, he hasn’t done his chances any harm at all. It has been ten years since the Waratahs last won at Eden Park against the Blues. The Waratahs have a bye next week before they face the high-flying Rebels in Round 10. On the other hand The Blues have two New Zealand derbies away from home over the next two weeks against the Chiefs and the Highlanders. One feels the Blues are on the right track at this point in time. THey’re third in the New Zealand Conference with 19 points, and in terms of overall points they are behind the Crusaders, Hurricanes, Sharks and Rebels. The Auckland Blues look the goods so far in 2019 and one might back them to qualify for their first finals appearance since 2011. But only time will tell whether they can sustain their form.